This article is about the mythological character. For other uses, see Daedalus (disambiguation). In Greek mythology, Daedalus (/ˈdɛdələs ˈdiːdələs/; Ancient Greek: Δαίδαλος Daidalos "cunningly wrought", perhaps related to δαιδάλλω "to work artfully" or “of knowledge”; Latin: Daedalus; Etruscan: Taitale) was a skillful craftsman and artist, and was seen as a symbol of wisdom, knowledge, and power. He is the father of Icarus, the uncle of Perdix, and possibly also the father of Iapyx, although this is unclear. He invented and built the labyrinth for king Minos of Crete, but shortly after finishing it king Minos had Daedalus imprisoned within the labyrinth. He and his son Icarus devised a plan to escape by using wings made of wax that Daedalus had invented. They escaped, but sadly Icarus did not heed his father's warnings and flew too close to the sun. The wax melted and Icarus fell to his death. This left Daedalus heartbroken, but instead of giving up he flew to the island of Sicily. Daedalus's parentage was supplied as a later addition, providing him with a father in Metion, Eupalamus, or Palamaon, and a mother, Alcippe, Iphinoe, or Phrasmede. Daedalus had two sons: Icarus and Iapyx, along with a nephew either Talos or Perdix. Ignoring Homer, later writers envisaged the Labyrinth as an edifice rather than a single dancing path to the center and out again, and gave it numberless winding passages and turns that opened into one another, seeming to have neither beginning nor end. Ovid, in his Metamorphoses, suggests that Daedalus constructed the Labyrinth so cunningly that he himself could barely escape it after he built it. Daedalus built the labyrinth for King Minos, who needed it to imprison his wife's son the Minotaur. The story is told that Poseidon had given a white bull to Minos so that he might use it as a sacrifice. Instead, Minos kept it for himself; and in revenge, Poseidon, with the help of Aphrodite, made Pasiphaë, King Minos's wife, lust for the bull. For Pasiphaë, as Greek mythologers interpreted it, Daedalus also built a wooden cow so she could mate with the bull, for the Greeks imagined the Minoan bull of the sun to be an actual, earthly bull, the slaying of which later required a heroic effort by Theseus. They had passed Samos, Delos and Lebynthos by the time the boy, forgetting himself, began to soar upward toward the sun. The blazing sun softened the wax that held the feathers together and they came off. Icarus quickly fell in the sea and drowned. 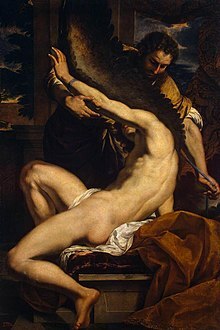 His father cried, bitterly lamenting his own arts, and called the island near the place where Icarus fell into the ocean Icaria in memory of his child. Some time later, the goddess Athena visited Daedalus and gave him wings, telling him to fly like a god. Daedalus was so proud of his achievements that he could not bear the idea of a rival. His sister had placed her son, named variously as Perdix, Talos, or Calos, under his charge to be taught the mechanical arts. The nephew was an art scholar and showed striking evidence of ingenuity. Walking on the seashore, he picked up the spine of a fish. According to Ovid, imitating it, he took a piece of iron and notched it on the edge, and thus invented the saw. He put two pieces of iron together, connecting them at one end with a rivet, and sharpening the other ends, and made a pair of compasses. Daedalus was so envious of his nephew's accomplishments that he took an opportunity to cause Perdix to fall from the Acropolis. Athena turned Perdix into a partridge allowing Perdix to land safely, and left a scar that looked like a partridge on Daedalus' right shoulder. Daedalus left Athens, after a time of hiding, due to this. Daedalus is said to have created statues that were so realistic that they had to be tied down to stop them from wandering off. In Meno, Socrates and Meno are debating the nature of knowledge and true belief when Socrates refers to Daedalus' statues: "... if they are not fastened up they play truant and run away; but, if fastened, they stay where they are." ^ R. S. P. Beekes, Etymological Dictionary of Greek, Brill, 2009, p. 296. ^ "This is the workshop of Daedalus," wrote Philostratus of Lemnos in Immagines (1.16), "and about it are statues, some with forms blocked out, others in a quite complete state in that they are already stepping forward and give promise of walking about. Before the time of Daedalus, you know, the art of making statues had not yet conceived such a thing." ^ The son of Eupalamus, according to Hyginus, Fabulae 39 (on-line translation at TheoiProject). ^ "Daedalus, the great inventor Daedalus". www.explorecrete.com. Retrieved 2017-11-08. ^ Iliad xviii, 590-3; the passage is often cited as a vivid and authentic reminiscence of Minoan Crete encapsulated in the orally transmitted tradition, as in Alfred Burns, "The Chorus of Ariadne" Classical Journal, 70.2 (December 1974 - January 1975:1-12): bibliography. ^ Robin Lane Fox, Travelling Heroes in the Epic Age of Homer, 2009:187, 178. ^ "The word da-da-re-jo-de on a has been interpreted as meaning Daidaleionde— "towards" or "into the Daidaleion," and K. Kerenyi conjectures that it may refer to the choros that Daedalus is supposed to have built for Ariadne" (Burns 1974/75:3; the Kerenyi assertion is in an article in Atti e memorie del primo congresso internazionale del micenologia, 1967, vol. II, Rome 1968). ^ Fox is unconvinced; other scholars urging caution in making connections with Daedalus are noted by Fox 2009:188 note 6: S.P. Morris, Daidalos and the Origins of Greek Art, 1992:76f, and L.M. Bendall, Economics of Religion in the Mycenaean World, 2007:17. ^ Compare labyrinth and maze. ^ Penelope Reed Doob, The Idea of the Labyrinth: From Classical Antiquity through the Middle Ages, 1992:36, ISBN 0-8014-8000-0. ^ Edith Hamilton, Mythology, (1942) 1998:151, ISBN 0-451-62702-4. ^ Erika Simon, "Daidalos-Taitale-Daedalus: neues zu einem wohlbekannten Mythos", Archäologischer Anzeiger (2004:419-22). ^ Pausanias, viii.46.2, ix.40.3-4; T.J. Dunbabin, The Western Greeks, 1948; S.P. Morris, Daidalos and the Origins of Greek Art (1992:199), all noted by Fox 2009:189 note 9. ^ In Hyginus, Fabulae, 39 Perdix is the name of the nephew; but according to Bibliotheca 3. 15. 8 and the dictionary of Suda (s. v. Perdikos hieron), Perdix is the name of Daedalus' sister and Talos is her son, nephew of Daedalus. The latter source also states that Perdix had a sanctuary dedicated to her near the Acropolis. ^ Beresford (translation of Plato), Adam (2005). Meno. pp. 97a–98b. og/2005/11/ekphrasis_ovid_in_pieter_breug.html Peter Hunt, "Ekphrasis or Not? Ovid (Met. 8.183-235 ) in Pieter Bruegel the Elder’s Landscape with the Fall of Icarus"[permanent dead link] – Essay on Brueghel's visualisation of Ovid. Smith, William; Dictionary of Greek and Roman Biography and Mythology, London (1873). "Daedalus"
Wikimedia Commons has media related to Daedalus.